On Saturday, June 23rd from 4-8 pm, Bainbridge Pride will have its first, city-sanctioned annual picnic at Waterfront Park. All the community is invited to share in this free, family-friendly event, with live music, food, vendors, crafts and speakers. The picnic is sponsored by Kitsap Pride and Bainbridge Pride, a new organization focused on sharing resources, events and information to all members and allies of our island’s LGBTQ community. In this podcast, BCB host Christina Hulet talks with Steven Facer, Eve Palay, Alex Sanso, and Derek Villanueva, who are helping organize and get the word out about this event. 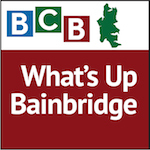 Listen as they have a rich discussion about their unique experiences living on Bainbridge. 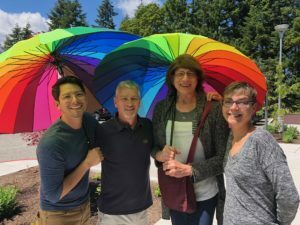 Together, they explore their experiences as LGBTQ community members on Bainbridge Island, what being a truly inclusive community means, and how to be a good ally. For more information or to get involved, please visit the Bainbridge Pride Facebook page or contact bainbridgepride@gmail.com.